The seller of this M3 starts off his ad with the sentence "It is rare to combine performance and luxury in one affordable package". How true. With the 4 door M3 you can add "practicality" to the sentence too. 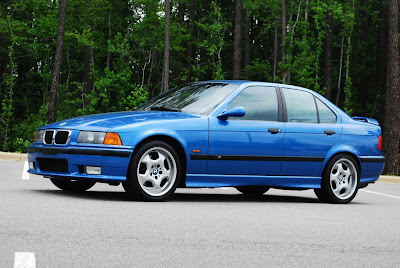 I never understood why BMW stopped importing the 4 door M3 after just two years. It really was the perfect combination of performance, luxury and practicality. The performance of the E36 M3 is amazing. The 3.2 liter 6 propels the car to 60 MPH in 5.5 seconds and gives it a top speed of 140 MPH. To handle that power BMW added firmer shocks and a larger anti-roll bar to the E36's already impressive suspension. BMW included 12" vented brakes to stop the car, and they did their job well. It would be tough to call any BMW a sleeper, but the M3 sedan comes close. The M3 E36 doesn't look a whole lot different than a regular E36. The front air dam is different, as is the lower body molding and the mirrors. The M3 also received different wheels and tires. To my eyes the M3 wheels are some of the nicest wheels ever to come standard on a sedan. The interior received very few modifications. The only major difference is the instrument cluster. For the past 12 years my daily transportation has been a 1995 E36 (not an M3, sadly). I can tell you first hand that the interior, the placement of the controls and the quality of the material in an E36 3 Series is about as good as it gets. This 2 owner car, located in Raleigh, NC, appears to be in great condition. Bright blue is not a color that usually appeals to me, but I think it looks great on this car. The seller, Weaver Motorsports is a dealer that specializes in performance cars. Their website is a lot of fun to browse. I was on the phone with a friend the other night and I mentioned how in the past few years I've found myself being less impulsive than I've ever been in my life. Writing about this car challenges that. A big part of me wants to blow off work for a few days, drive to North Carolina and drive home in this M3. This is a car I'd love to own. Click here to see the Craigslist listing for this 1997 BMW M3. Click here to find the reveuro.com BMW M3 buyers guide. It covers, in text, pictures and video, all M3s from the E30 through the latest E90 / E92 / E93 cars.